Western sides of first and second hills. The Great Coordination Point Expedition travelled to northern Italy twice in the fall of 2004. The mission: Find and investigate three hills in a regional park northeast of Milan, hills revealed by satellite photography to have distinct pyramidal shapes and edges. Background information: RealityTest -- Italian Article -- Czech Article. Part of southeastern slope of third hill. The mission was successful; a full report on this truly ancient and long forgotten sacred site will be published in the premiere issue of RealityTest's Explorer. Until then, please feel free to read the Expedition Reports. In 2003 a mailing list discussion regarding the Mexican pyramids led me to do a web search to refresh my memories. The search also brought up a number of obscure websites trumpeting the discovery of "Pyramids in Italy!" Curious, I viewed the sites. They implied that stone pyramids like those in Egypt, so old so as to have been covered by soil and vegetation, had been revealed by satellite photography. None of the website creators had actually visited these "pyramids," however, and I began to grow suspicious, wondering whether this was a hoax. The satellite photos were interesting, showing pyramidally shaped hills, but it was impossible to know for sure what was on the ground by viewing these alone. Every so often I would come across more information, and eventually I found what looked like a bonafide Italian tourist website featuring the hills and also an obscure on-line Czech journal that had sent a team to inspect them. These sites convinced me that there was something to these hills; whatever it was, the best way to find out would be to inspect them personally. The thought of travelling to Italy to do this seemed a great fantasy, but nothing more. As a number of my friends and associates are amateur channellers, I occasionally asked them for channelled information regarding the site and began to accumulate consistent information. This was supplemented by participating in two on-line sessions in which we entered a mild trance condition and imaginatively journeyed to the site. The information acquired was tantalizing (I provide a brief summary below); aside from describing the activities of an unknown ancient people, the locations of two coordination points -- one of great strength, if somewhat dormant -- were pinpointed. The hills had entered the domain of The Great Coordination Point Expedition. I was intent on creating material for the Explorer publication mentioned above (that project was subsequently delayed but will likely resume in the future) and finally decided a visit to these hills could provide just that. I was also feeling the need for a change of pace; a trip to Italy seemed like an excellent way to satisfy this. Before long, I'd made my travel arrangements, agreeing to rendevous in Italy with two friends from the 2001 London Expedition. The first Italian Expedition began with my overnight flight across the Atlantic. After changing planes at Heathrow, I flew over the Alps and landed at the gigantic Malpensa Airport northwest of Milan. For the first time in my life, my luggage did not arrive with me; very tired, somewhat disoriented (this was my first trip to Italy), and suffering from a severe case of nicotine deprivation, I waited in line to fill out the required form. Afterwards I rented a tiny yet swift diesel Citroën C2 (I would love to own one; unfortunately, it is unavailable in the U.S.) then awaited the arrival of Alison and Mike from the UK. Eventually they appeared. Their presence brought renewed energy and soon we were on our way, cruising along the Autostrade. Despite our combined brainpower, we missed a major turn and before long were backtracking on smaller roads in a countryside none of us were familiar with, admiring the distant mountains to the north even as the light of day began to fade. We carefully examined our maps and stopped to ask for directions, but even so wondered whether we would find our hotel before nightfall. Thank goodness for Auchan, the French "hypermarket" chain! A billboard alerted us to the fact that we were on the road to the nearest Auchan store, and that it was only so many kilometers and so many minutes away; this store happened to be in the same town as our hotel. All we had to do now was to follow these billboards; before long we arrived at the store, very happy to discover that our hotel was next door. Melas Hotel is one of those rare hotels where the staff goes all out to make its guests feel comfortable; our inability to speak or understand Italian presented no obstacle to the multi-lingual Roberto, who checked us in. Soon I was fast asleep, unable to care whether my luggage would ever be found. The next morning, as we enjoyed a full continental breakfast -- one of the pleasures of the place, a smiling Roberto appeared and announced that my luggage had arrived and been placed in my room. Things were looking up! We asked for directions to Parco Regionale di Montevecchia e della Valle del Curone, in which the three ancients hills are located, no more than four miles from the hotel. Roberto obligingly drew us a map and before long we were in the car, headed to Montevecchia. We found Montevecchia without difficulty then continued through Alto Montevecchia to an entrance to the park, after driving up a narrow road complete with hairpin turns and stopping at an overlook to admire the countryside. Unfortunately, the road came to an end, blocked with large stones owing to a collapse. We got out of the car and proceeded on foot, eventually sighting the hills across a valley. Certain temporary ailments prevented us from hiking to them (the park, which includes farms and villages, also features a large network of trails and signs) leaving us no choice but to backtrack and attempt to find our way by car. This proved challenging, as none of the local roads near the hills were on our maps, but in time we succeeded. The hills are immediately behind the villages of Monte and Cereda, a small parking lot carved out of the base of the first hill, "la collina dei cipressi" (Hill of Cypresses). This hill has what's left of a circle of twelve very old cypress trees at its summit -- four trees, the rest stumps; someone in modern times lugged up a cement altar, placing it within the circle. Signs of agriculture are everywhere, many of the various slopes terraced for wine growing; off in the distance a rooster crows and the bell of a tower tolls. This is a place of magic, yet the magic is hidden within its peace and beauty. We explored the site, then feasted on items purchased at Auchan (which includes a terrific supermarket). Others, too, were picnicking on this beautiful Sunday afternoon. We made one more visit to the site, on another day, in the meantime roaming through nearby Merate and enjoying the excellent Italian food -- including a fantastic meal at Ristorante Toscano -- during evening excursions. All too soon, it was time to leave. I was dissatisfied. I'd come armed with the channelled information mentioned above, including the transcripts from the on-line group sessions. I hadn't found any proof of that which all of this information had suggested. I'd missed something, somehow, and my feelings weren't improved by knowing how rusty my photographic skills were; a slowly developing gum/sinus infection didn't make things any better, either. Alison and Mike left by train before I did; then I missed a turn returning to Malpensa, soon finding myself lost in downtown Milan, sans navigator and with no place to pull over amidst the heavy traffic. Persevering, I eventually found my way out of the city. The highlight of the return trip was discovering the smoker's lounge at Heathrow, although the place reeked -- even to me, a heavy smoker -- and seemed designed to make its users feel like addicts, furtively engaged in maintaining their habit. I hadn't considered returning to Italy, despite my dissatisfaction. Meanwhile, my face had swelled up from the gum infection. Soon, my 35mm slides (and a CD-ROM) were ready. Only a few shots pleased me, and then I remembered the photo I'd taken of the lizard -- it was the last one on the CD-ROM. I had taken it after meditating on the Hill of Cypresses then taking one last hike down the trail towards the third hill. Small green and red lizards were hiding in the underbrush on the sides of the trails -- you could hear them skittering about but it was rare to actually see one, rarer still for one to sit still long enough to be photographed. 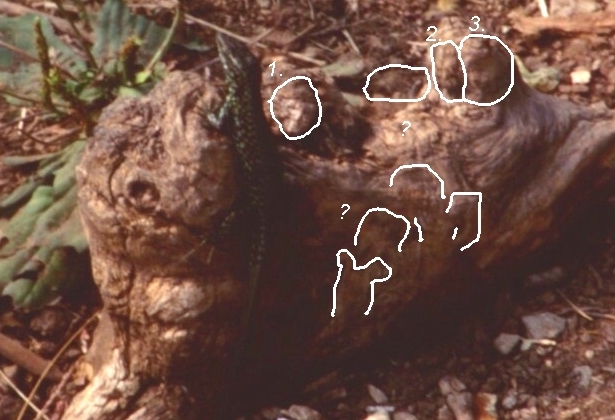 In this case, a lizard was sunning itself on a tiny stump right on the trail, long enough for me to take its photo before vanishing instantly at the click of the shutter. This time I flew to Brussels, not Heathrow, avoiding the frequent delays in landing at that colossal nexus that can contribute to lost luggage, then on to Linate, an older airport much smaller than Malpensa and much closer to the site. The November air was colder and clearer than October's, the mountains to the north now including more distant and snow covered peaks, as seen through the windshield of my second rented Citroën C2. I arrived at Melas Hotel, checked in and slept, greeting GCPE explorer Tim (read of Tim's adventures at his blog site) upon awakening. Soon we were catching up over another fantastic dinner at Ristorante Toscano. The next day we went to the site. It is my intention to validate the channelled information I have on the site, but I will provide only a brief summary here, as the full site report (which will require additional visits) is destined for RealityTest's Explorer publication. The site includes two significant coordination points; the stronger of the two is centered within a small earthen chamber within one of the hills. The tunnel to it collapsed thousands of years ago in an earthquake. This chamber was used for birthing -- anyone born in it gained a particular kind of status -- and as a kind of paleolithic sensory deprivation room. The second coordination point is closer to the surface and near another hill. Channelled information also spoke of the great age of the site, with artifacts buried here and there; within twenty years archeologists will be mapping out a network of sites throughout the Mediterranean region associated with those who shaped and used this site. Whoever they were, they were consciously aware of coordination points, an awareness shared with whoever first built structures on the Giza Plateau. A number of websites maintain that the pattern of the hills is like that of the Giza pyramids, both sites mirroring the belt of the constellation Orion, but things aren’t quite as simple as that; a full explanation will appear in the Explorer article. I had precise information regarding the location of the tunnel opening but much of the site includes private property -- during my visits cows and horses grazed in fenced off sections of the second and third hills. All things considered, the best I could hope for was to gain a good sense of the site -- digging was out of the question and I had no intention of trespassing. With some persistence, Tim and I found and followed a somewhat hidden and lightly used trail to the summit of the third hill. There, an old shed sat amidst a tangle of underbrush. We climbed down and continued our explorations, thoroughly enjoying the scenery and the aura of the place. The next day, for a change of pace, we drove to Lake Como and wandered all over the town, fascinated. The following day was cold; I drove Tim to the train station and then went back to Melas Hotel and slept.